This little Chicks card has been created from some punched circles and some die cut ovals. To make your chicks you will need to cut two large circles in yellow for the bodies. Then also from the yellow I have cut three medium circles for the heads, and another one for the wings. One of them needs to be cut in half. Cut a tiny triangle of orange that you will use for the beaks. 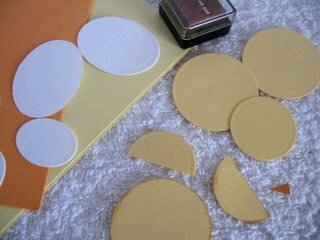 Then you will need to punch or cut three white ovals for the eggs. Add the two bodies to your card, in the position you want them, with some small foam pads to give them some height. Then add the heads to the two bodies at an angle, and attach the tiny orange triangles for the beaks. Attach the cut half of a circle to the body as shown for the wing and hand draw some feet to the bottom of the body circle. 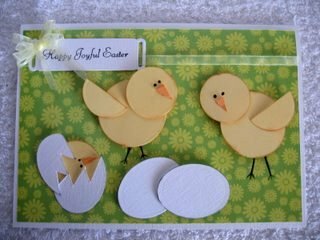 Two complete egg shapes have been added to the bottom of the card and another has been cut with an uneven edge to appear broken. And this one has a chick head peeping out of the crack with the top part of the egg on foam pads to lie over the chicks head.